Anaplasma phagocytophilum strains often vary in Msp2 expression, a situation assumed to be related to immune evasion. However, Msp2 is also an adhesin, and little is known about the role of endogenous msp2 transcriptional changes in the absence of immune selection. Thus, Msp2 profiles and msp2 transcripts of low passage A. phagocytophilum Webster strain, initially comprised of a single abundant msp2 transcript, were re-examined after ≥ 20 in vitro passages without immune selection. Using an Msp2 monoclonal antibody, immunoblots revealed an unchanged dominant band and several weak bands that appeared with passage. Similarly, msp2 transcript diversity changed, with a decrease in the initially abundant low passage transcript and appearance of a newly abundant and several minor msp2 transcripts with high passage. BLASTN search of the A. phagocytophilum HZ strain genome revealed ≥ 52 msp2 paralogs. Msp2 expression and msp2 transcription modulate even without immune selective pressures. However, the limited diversity of msp2 transcripts in the absence of immune pressure suggests selection for Msp2 by specific functions beyond that of immune evasion, in spite of a large genomic reservoir for Msp2 diversity. Anaplasma phagocytophilum is the causative agent of human granulocytic anaplasmosis (formerly named HGE) and granulocytic anaplasmosis in animals. Human, horse, and canine infections are acute and self-limiting [1–3], whereas ruminant and rodent infections may persist [4, 5]. As for Anaplasma marginale, A. phagocytophilum strains from different geographic regions are antigenically variable , and the emergence of antigenic variants in vitro and in vivo suggests a role in immune evasion and persistent infection [7–10]. Antigenic variability results from differential expression of immunodominant surface proteins (Msp2, p44, 44 kDA), encoded by a multigene family [10–12]. Msp2 expression is polymorphic in vitro, in mice, and in ticks [13, 14]. Based in part on these investigations where changes were characterized under immune selective pressure or in poorly defined polyclonal populations in vitro, the prevailing opinion is that antigenic diversity is generated as a mechanism for immune evasion. However, among 18 unique msp2 paralogs detected in uncloned low passage A. phagocytophilum Webster strain, only 1 of 7 transcripts was dominant in number . With the discovery that Msp2 is an A. phagocytophilum adhesin for granulocytes, we hypothesized that Msp2s are also selected by non-immunological processes based on fitness for specific niches, such as growth in mammalian granulocytes. Before such hypotheses can be addressed, it is important to characterize and monitor endogenous changes in msp2 transcription in the absence of selective pressures under defined limits of in vitro propagation. Thus, msp2 transcripts of A. phagocytophilum Webster strain were investigated after 20 in vitro passages, compared to transcripts characterized after only 7 in vitro passages. To ascertain whether Msp2 expression changes with in vitro passage, immunoblotting with a broad range Msp2 monoclonal antibody was performed. Msp2 was identified after 17 passages in vitro as an intense band and a weaker band at approximately 48 and 30 kDa, respectively. After 23 passages, additional weak bands at 46, 43, 40 and 37.5 kDa were detected, and the 30 kDa band became less intense [Figure 1]. To detect changes in transcription after in vitro passage, RT-PCR using msp2 universal primers was performed at 7 and 20 in vitro passages. A 550-bp RT-PCR product was amplified from high passage A. phagocytophilum Webster RNA template, and no DNA was amplified. Of 64 clones, 58 were successfully sequenced. When aligned with the previous 18 unique A. phagocytophilum Webster strain msp2 paralogs , 4 additional msp2 paralogs with unique hypervariable regions [Figure 2] were identified. Of all the sequences from these clones, 28 (48.3%) were transcribed from one newly identified msp2. Each of the 3 other new sequences were identified only once (1.7%) among the 58 transcript clones. The remaining 27 clones (46.6%) had sequences identical to those previously identified among the msp2 s transcribed in passage 7, including 15 (28%) derived from the predominant paralog transcribed in low passage. When aligned with predicted open reading frames for fully sequenced msp2, amino acid translations identified conserved N- and C-terminal peptides flanking a hypervariable domain ranging from 70 to 79 residues. 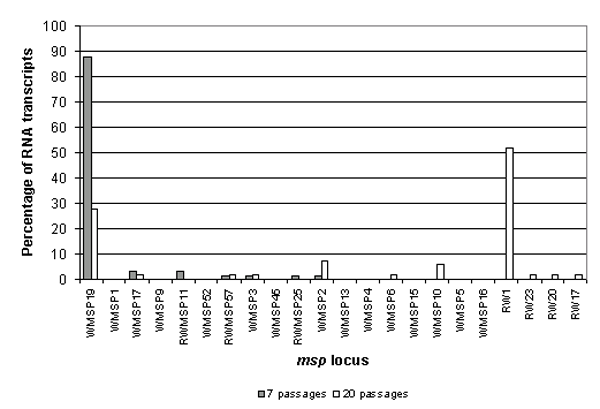 Histogram of 22 msp2 loci and percentage of total RNA transcripts detected at low and high passage for A. phagocytophilum. Frequency of msp2 transcript detection in low passage (7 passages in vitro, represented by shaded bars)  and high passage (20 passages in vitro, represented by open bars) A. phagocytophilum Webster strain for each of 22 distinct loci detected. It was possible that the 4 newly identified msp2 transcripts in high passage cultures resulted from recombination of existing msp2 s. However, by targeting hypervariable regions in DNA PCR, each new msp2 paralog was detected in the genome of the nearly clonal low passage A. phagocytophilum, establishing their a priori existence. In addition, each new msp2 was subjected to BLASTN against the 18 low passage partial msp2 s  and low E value hits were examined by pairwise alignment for blocks of shared nucleic acids. Overall sequence identities were between 69 and 74% with the best matches. When 5', 3', and hypervariable regions were examined separately, sequence identities between 78 and 84% were obtained for 5' regions, between 86 and 96% for 3' regions, and between 49 and 69% for hypervariable regions, reflecting a lack of large recombined msp2 regions that would result in a simple mosaic appearance. Sequence dissimilarity was distributed throughout the entire hypervariable regions, mostly resulting from single or short stretches of insertions or deletions [Figure 3]. ClustalX alignment and consensus amino acid sequences of Msp2 hypervariable domains. Domains were translated from genomic and RT-PCR amplicons of A. phagocytophilum Webster strain msp2 after 7 and 20 passages in vitro. The alignment demonstrates the heterogeneity of the hypervariable domains and the lack of significant similarities that would suggest combinatorial gene conversion as a mechanism for ongoing Msp2 antigenic variation. Paralog names are listed on the left, the total number of amino acid residues is shown on the right; the consensus sequence is shown on the bottom – "." indicates a semi-conserved position, ":" indicates a highly conserved position, and "*" indicates a conserved position. Translation of hypervariable region sequences revealed a similar level of divergence in multiple positions except for a high degree of conservation in only 2 positions. Compared with the amino acid sequence of A. phagocytophilum GenBank accession no. AF029323 , all hypervariable domains had a conserved Cys at residue 124, and a conserved consensus Lys-Asp-Trp-Pro-Thr-Ser/Gly motif at residues 148 through 153, as described by Zhi . The latter residues were preceded by a predicted helical structure in 17 of 22 paralogs. The C-terminus of each translated amplicon had 2 tandem helical hydrophobic domains, and the N-terminus of each shared 2 consecutive helical domains and 2 tandem beta strand-like elements. A TBLASTN search against the A. phagocytophilum strain HZ genomic DNA sequences detected 219 homologous segments in 19 different contigs with E-values <0.001. The average and median sizes of contigs were 62 and 20 kb, respectively. From the TBLASTN output, 86 translated amino acid sequences ≥ 100 residues and uninterrupted by in-frame stop codons were extracted. Because msp2 has conserved 5' and 3' ends, some segments might have originated from one gene; thus, one from each sequence pair within 1 kb on the same strand of a single contig was removed leaving 57 sequences. One from each sequence pair that had identical amino acid sequences was also removed, resulting in 54 remaining segments. The average pair-wise sequence identity among these was 59%, similar to that of A. phagocytophilum Webster strain paralogs. Finally, BLASTP searches carried out against the SWISS-PROT/TrEMBL non-redundant sequence database  confirmed that 52 of 54 sequences were best-matched with known Msp2s. One was best-matched to Ehrlichia chaffeensis major outer membrane protein OMP-1A (TrEMBL accession no. O52102) and the other to Anaplasma ovis major surface protein 4 (Q8KWV5). Msp2 is the immunodominant protein expressed in both A. marginale and A. phagocytophilum. The encoding msp2 s are believed to allow the generation of antigenic variation and persistence in reservoir hosts [8–12, 15, 17, 18]. In addition, A. phagocytophilum Msp2s are heterogeneous among geographically distinct isolates  and this diversity may be important for infection in reservoirs such as rodents, ruminants, and cervids [4, 5, 19]. The mechanisms of persistence of Anaplasma marginale and many other microorganisms involve gene recombination or conversion and expression of new antigens that allow immune evasion [20–24]. However, another hypothesis is whether a non-immunologic functional role for individual msp2 paralogs influences selection when expressed in specific niches such as the mammalian or tick host [13, 14]. Experiments conducted under immune selective pressure, such as in vivo mammalian infection, or with cultures of undefined bacterial clonality are unable to provide supportive data for such alternate roles. Previous characterization showed that very low passage strains of A. phagocytophilum possess a single abundant msp2 transcript , which coupled with new data confirming a single expression site for A. phagocytophilum , indicates a relative uniform clonal population. If immune selection is the driving force for Msp2 diversity, propagation in vitro in the absence of immune pressure should allow the generation of multiple Msp2 variants. Thus, starting with a low passage, nearly clonal strain of A. phagocytophilum, changes in endogenous msp2 transcription were analyzed when immune selection was absent. The identification of 4 additional unique msp2 paralog transcripts in A. phagocytophilum Webster strain after prolonged in vitro passage without immune selection suggests a role for either combinatorial recombination or gene conversion, as described for A. marginale . However, all 4 new msp2 genes were identified in the genome of clonal low passage A. phagocytophilum excluding the possibility that each was generated by a new recombination event. Although proof of a role for A. phagocytophilum msp2 s in immune evasion is lacking, changing Msp2 expression does alter antigenicity, and could contribute to evasion [13, 14]. However, only minimal antigenic changes were observed, and these could equally reflect structural changes anticipated to occur with selection of alternate adhesins. It is strongly suspected that transcription of msp2 occurs from perhaps a single site in the chromosome, and that msp2 transcriptional changes imply at minimum, emergence of new populations after gene conversion [7, 8, 25]. The incomplete A. phagocytophilum strain HZ genome revealed more than 50 msp2 paralogs and/or pseudogenes of over 100 amino acids. This suggests that a vast capacity for Msp2 diversity is already "hard-wired" and that only simple gene conversion into a transcriptional site is required. Regardless, these findings illustrate that even without immune pressure, spontaneous genetic changes can accrue, but do so in a very limited fashion. It may be that human infection selects for certain Msp2s, explaining the abundance of a single or small number of msp2 transcripts in human HL-60 cell cultures, whereas other Msp2s may more efficiently bind tick cells or neutrophils in reservoir animals. In partial support of this concept, Carlyon et al. recently described an alternative murine neutrophil ligand that differs in scaffold protein from platelet selectin glycoprotein-1 (PSGL-1) on human neutrophils . What evidence is there that Msp2 has a role other than in immune evasion? Although msp2 transcript diversity increases with mammalian cell passage, the effects are not neutral. Given the implied requirement for frequent emergence of variation to resist mammalian immunity , one might predict that a larger diversity and a more uniform frequency of msp2 transcripts would appear. Instead, prolonged passage is associated with the appearance of only 2 major msp2 transcripts over 20 or more passages – an interval usually greater than 4 months of continuous in vitro propagation. Moreover, despite the relative lack of selective pressures, the absence of any transcripts that would indicate significant gene recombination suggests that msp2 s of individual strains are moderately stable, at least in vitro. Taken together, these data further suggest that some Msp2s have specific functions that are selected for by environmental conditions and niches. Indeed, both Zhi et al. and IJdo et al. have also demonstrated a restricted profile of msp2 transcripts under several conditions including tick infections [13, 14]. An important function of Msp2 may be to provide bacterial antigenic diversity wherein immune recognition of the abundant bacterial population is targeted. Antigenically diverse bacterial clones temporarily survive and contribute to reservoir persistence. However, the high level of expression, the conserved flanking regions with relative conservation of structure, and highly conserved residues within the hypervariable domain suggest the potential for other roles, such as cell adhesion [27–29]. Moreover, the possibility that changes in Msp2 expression are associated with changes in A. phagocytophilum pathogenicity has not been investigated. Low passage A. phagocytophilum Webster strain causes disease in horses similar to natural human infection, but prolonged in vitro propagation, which leads to changes in msp2 transcription and Msp2 expression, attenuates clinical signs in the horse model . The change in virulence may ultimately be unrelated to changes in Msp2, but as host immune response is the predominant correlate of histopathologic lesions and disease [31, 32], this hypothesis and the functions of specific Msp2s in various niches warrant further investigation. Msp2 expression and msp2 transcription in A. phagocytophilum display limited diversity under nonimmune-selective conditions despite long intervals of passage, suggesting that Msp2 has other functions beyond generation of antigenic variation for immune evasion. With the recognition of its role in adhesion to host cells, Msp2 diversity could also be an important adaptation to alternate niches such as small mammal or cervid reservoir neutrophils or tick cells. A. phagocytophilum (Webster strain) was propagated in HL-60 cells . Infected cells were harvested for nucleic acid preparation  and bacterial density gradient purification . Protein immunoblotting  used Msp2 monoclonal antibody 20B4 that reacts with all A. phagocytophilum strains tested. Webster strain in vitro passage 20 msp2 RNAs were compared to those obtained at in vitro passage 7 . To demonstrate changes over prolonged passage, a sample of convenience that compared Msp2 expression at passage 17 with passage 23 was examined by protein immunoblotting. Cell cultures were harvested when >90% of cells were infected, and identical protein quantities were loaded onto SDS-PAGE gels for comparison. DNA was prepared from infected HL-60 cells using the QIAamp DNA Mini Kit (Qiagen, Valencia, CA). RNA was prepared from infected cells using the RNeasy Mini Kit and a QIAshredder (Qiagen, Valencia, CA). Genomic DNA contamination was eliminated by the use of RNase-free DNase (Qiagen, Valencia, CA) during extraction and again after preparation of the final RNA. DNA and RNA concentrations of each preparation were determined. Primers for amplification of msp2 were created from the alignment of 10 A. phagocytophilum msp2 sequences in GenBank, as previously described . Primers [Table 1] were used in both PCR and RT-PCR reactions at a final concentration of 1 μM. Amplification from A. phagocytophilum nucleic acids was determined by PCR using DNA from the Webster strain and RT-PCR was performed on RNA also from the Webster strain. DNA PCR was performed as previously described , except for the use of primers designed to specifically amplify the hypervariable regions in the newly identified msp2 transcripts [Table 1]. The specificity of all primers was tested by using E. coli and Ehrlichia chaffeensis DNA templates. msp2 hypervariable region primers to determine newly identified msp2 paralogs in low passage A. phagocytophilum genomic DNA. For RT-PCR, a one step PCR protocol using RT-Taq (SUPERSCRIPT One-Step RT-PCR, Life Technologies, Gaithersburg, MD) and 30 ng of RNA from infected cells was employed as per manufacturer's recommendations . DNA contamination in the RNA preparations was assessed by the same PCR method substituting Taq for RT-Taq polymerase. Agarose gel electrophoresis and ethidium bromide staining were again conducted to assess a 550-bp cDNA fragment. cDNA RT-PCR products were cloned into the pCR4-TOPO vector (Invitrogen, Carlsbad, CA) by transformation into TOP 10 E. coli plated onto LB agar (50 μg/ml kanamycin). Plasmids from each of 64 colonies (Wizard Plus Minipreps DNA purification System, Promega, Madison, WI) were assessed for insert size after Eco RI digestion. Plasmid inserts were cycle-sequenced using the Big Dye Terminator Cycle Sequencing Ready Reaction (Applied Biosystems, Foster City, CA) and was performed  with 175 ng of plasmid DNA and M13 forward and reverse primers. Products were purified using Centrisep spin columns (Princeton Separations, Adelphia, NJ) before sequence determination (ABI Model 377, Foster City, CA), assembly (Assemgel, PCGENE, Intelligenetics, Mountain View, CA), alignment (CLUSTALW v1.4) , and visualization of phylodendograms (TreeView v1.6.1) . Some nucleotide comparisons used BLASTN analysis . Translated protein secondary structure was predicted with NNPREDICT http://www.cmpharm.ucsf.edu/cgi-bin/nnpredict.pl. Using the amino acid sequence of A. phagocytophilum Msp2 (GenBank accession no. AF037599) as query, the A. phagocytophilum strain HZ unfinished genomic sequences were searched using TBLASTN on the Institute for Genomic Research server (TIGR; http://www.tigr.org). The shotgun phase of sequencing is complete, and as of February 6, 2003, the data included 54 contigs totaling 1,507,831 bp. BLASTP searches against the SWISS-PROT/TrEMBL non-redundant sequence database  were used to confirm best matches for TBLASTN-identified sequence segments. The nucleotide sequences of the 4 newly identified Webster strain msp2 hypervariable regions are deposited in GenBank under accession numbers: AY253529, AY253530, AY253531, AY253532. DGS performed molecular biological techniques and sequence analysis, alignment, interpretation, and manuscript preparation. KC performed some amplification and cloning reactions and assisted in initial design. HO performed bioinformatics manipulations to assess the genomic content of the A. phagocytophilum HZ strain. JHP assisted in design of the study and assisted with molecular techniques. JSD was responsible for overall design of the study, analysis and interpretation of data, and assisted with manuscript preparation. Supported in part by grant no. RO1-AI44102 from the National Institutes of Allergy and Infectious Diseases (JSD) and by National Research Service Award training grant no. RR07002 from the Public Health Service (DGS and KC). We thank Kristin Asanovich and Jen Walls for superb technical assistance with cultivation and protein immunoblot analysis, Surekha Patil for help with preparation of sequencing reactions, the sequencing team in the Molecular Microbiology laboratory of The Johns Hopkins Hospital for help with sequence analyses, and J.S. Bakken, M.D., Gary Wormser, M.D., and John Madigan, D.V.M., for contributions of clinical samples for microbial isolation. Preliminary sequence data of the unfinished genome sequences of A. phagocytophilum strain HZ was obtained with permission from The Institute for Genomic Research website at http://www.tigr.org. Sequencing of A. phagocytophilum was accomplished with support from National Institute of Allergy and Infectious Diseases and the Ohio State University.